Drone video future views has the power to not only pre-sell and sell properties, it has the power to change the commercial real estate development marketing industry. Commercial real estate marketing has many stages and for the last few years we have primarily been focused on finished asset marketing. Recently, I noticed the gaping hole in commercial real estate marketing opportunities in the pre-construction and construction phase. Creating content has become more and more paramount for commercial real estate companies. Pre-construction views give everyone from your sales team to your marketing suite powerful content for telling the beginning of your story. Using pre-construction views add instant value and can be designed to show the area you are building in but also the views of each apartment, condo or office space that you are marketing. Our latest offering that we’ve created is the “Commercial Real Estate Power Panorama” and it generates fantastic multimedia content for websites, social media, on-site sales, meetings and beyond. The commercial real estate power panorama adds context to any marketing plan whether you actually have the asset, yet, or not. For example, you have an empty lot and creating amazing context for the upcoming building by looking outward in all directions from the space. The example below was created with this format in mind. Call out restaurants, locations, and parts of the city that will help you sell your asset. You can also create video views from specific units or a 360 video view of a specific floor…or both. This power panorama application could replace your website in the early stages of construction. These new media examples are very popular as an approach when you have no asset built, yet. Since there are a myriad of content ideas you can present in unique ways. 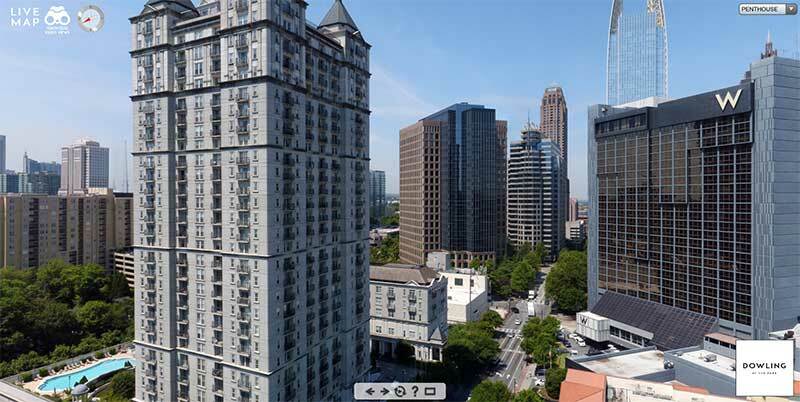 Commercial real estate video embedded within a panorama is very powerful. Here is a detailed explanation of our “power panorama”. The sky is the limit and we have countless production ideas for all budgets, plus you can use your brand colors, fonts and logos to customize the presentation. In the example below the power panorama is heavily populated with content purely for exploration and is acting as a menu in this instance to showcase the elements. In most cases a commercial real estate brand would only execute a few of the mechanisms seen in the panorama. Explore the numbered list below the power panorama to understand the different elements embedded in the page. We have embedded the power panorama here for demo purposes, but most would be exploring in a full screen scenario which you can view here. The other great news is that the power panorama looks just as amazing on mobile as it does on a desktop.